The authorities should take a stance favouring the sentiments of the devotees by initiating immediate measures to protect the ongoing practices of Lord Ayyappa temple. 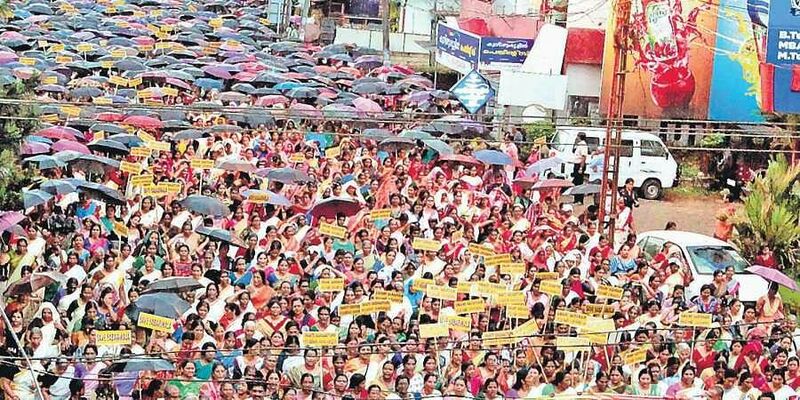 PATHANAMTHITTA: Braving rain, tens of thousands of devotees, a majority of them women, participated in the prayer yagna to protect the ongoing practice of Sabarimala Lord Ayyappa temple, organised under the auspices of Adoor NSS taluk union and other Hindu organisations in Adoor on Saturday. The prayer procession, chanting Ayyappa songs, was set off the two-km padayathra from Adoor-Peringanad-Chennampally Sree Sastha temple to Adoor Gandhi Maidan after passing through the main road at 4 pm. Inaugurating the prayer meeting, Adoor NSS Taluk Union president Kalanjur Madhu said the yagna was organised to protect and preserve the ongoing practices of Sabarimala temple restricting the entry of women between the age group of 10 and 50.Madhu said the prayer yagna was not against any political party or with any vested interest but with the overall aim of protecting the sentiments of crores of Sabarimala devotees and the customs and practices of the temple. Delivering the keynote address, Pandalam Kottaram Nirvahana Samithi president Sasikumara Varma said the devotees were forced to come out to the streets to protect the Sabarimala hill shrine and religious sentiments. The authorities should take a stance favouring the sentiments of the devotees by initiating immediate measures to protect the ongoing practices of Lord Ayyappa temple. SNDP Union assistant secretary Ebin Ambadiyil, Anandan Changamala, Prasad Angadickal, N K Podiyan and Arun Sharma spoke. Prayer yagnas were taken out under the auspices of Ranni NSS taluk union and Thiruvalla taluk unions in which thousands of devotees took part.